"Illusion" is a 1958 35ft Constellation Bullnose. The previous owner had her for 40 + yrs. She has been boat house kept for all those years in Algonac, Michigan where she has been for most of her life. She is 100% original and was delivered to a fabrication company in Detroit in December 1957. "Illusion" is powered by a pair of MCLs with dual updraft carbs. Shortly after delivery the 2nd owner (who purchased her from his partner) changed her from Chris O Matic to Manual. I do have the original Chris O Matic complete shift kit though. She is entirely made of mahogany and teak. 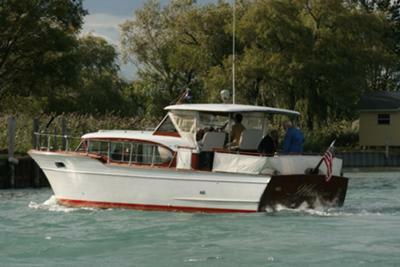 We spend our time with her traveling between Lake Erie and Lake St Clair. We also have a 1969 38 ft Commander that I am currently renovating. I am planning to keep "Illusion" to finish her and then we will see what the future holds. I kinda forgot all about this site! Im sorry to the 2 guys that commented... trust me... I never saw the comments! I just sent this all to my hubby for review. Illusion is in the water downriver at this time along with our Commander. Never heard back from you from my last post. Am going to be purchasing a 69 38 foot constellation which I will be renovating. Would love to speak with you and maybe come up to Algonac and get some pointers and ideas on how to do the work right. I live close in |Detroit. Any help would be appreciated and would love to just see what an Illusion looks like in person. I am currently purchasing a 1969 38 ft constellation in detroit that needs some work. Drop me a line or email address and we can compare notes.